Mary Clark, read the full review on Amazon. “The reader is left with strong images, of love, death, nature, relationships, poignant reminiscences from journeys. I returned several times to the drama of ‘Far Above Rubies.’ In the scene a woman looks from a window over the ramparts of a castle, is then blindfolded by her husband and led to the window of another room. A few facets: ‘… he put his hand in the small of her back …’ such a gentle gesture, followed by … ‘he pulled the cloth hard from her head … shocking her … she watched the body move this way, that way … listened to the rope creak …’ The woman’s response (I won’t give it away) renders her husband’s revenge futile. “A Jar of Sticklebacks presents a portrait of the last hundred years through the vision of its writer, whose presence is rooted in his beloved Hoole (a part of Chester). This is the century covered by his own life, and the lives of his parents and grandparents, whose dramatic times he briefly shared but whose survival in the face of war and revolution persistently and movingly intrude on the world that the poems evoke. History goes beyond recollection and much of David’s work reawakes the pasts of the worlds and places that his own life has visited. His awareness of the role these have had in shaping everything he knows is everywhere – most obviously in A Short History, and Natural Selection, but the tread of the past is usually to be heard. Even in the poems reflecting his recent visits to South Africa, you can hear the sound of colonial Africa’s bones rattling in the townships of Soweto. The poem of the title is the present end to a journey evoked by the majority of poems. The jar in question is broken, and the fish’s survival is in doubt, but not the memories, hopes and dreams that they come to represent. The poem itself explores David’s memories of his grandfather, and his knowledge of his father (who died in Africa, with David and his Mother left at home). Its dedication to his granddaughter, perfectly describes a man for whom love and wisdom have helped transform his outlook on a world that has seen conflict and disillusionment, but where hope and delight still triumph. The natural world continues unabated in the background for most of the poems – most notably by his continued love and observation for birds. Robins, gulls, swallows, and buzzards are just some of the avian characters that swoop and nest in the poetry. They represent for a town dweller an obvious reminder of nature beyond a bypass (and David has a poem about one of these too), but they also bring a reminder of distant lands and lives that is both human and non-human – they happily nest in skulls and, elsewhere, menacingly threaten a quiet meal of fish and chips. David’s gift is for reflection and evocation – it is often photographic in its quality (and his book is well illustrated by the photographs taken by Sylvia his wife). You’ll see this in the almost filmic visions of Soweto, and obviously in Looking for Puffins, where the composition of a photo brings together his family, both as a picture, and a portrait of its inner life. 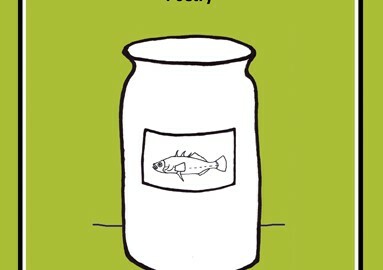 Purchase A Jar of Sticklebacks.